Vata: air and ether is movement. Pitta: fire and water is transformation. Kapha: water and land are cohesion. We are therefore born with a proportion of each of these doshas and we always aim to rebalance them to avoid health problems. The doshas are influenced by internal and external factors, especially the climate and seasons! As autumn arrives, it is the dosha Vata that begins to accumulate and tends to get worse. Cold, wind, drought increase Vata in the body. However, the latter is responsible for multiple worries and illnesses such as dryness, constipation, bloating, night waking, mood swings, anxiety, painful periods, irregular appetite, etc. The qualities of Vata are: cold, light, dry, mobile, rough, subtle, hard, irregular, fast. To limit the accumulation of wind in the body, we increase in our daily lives all its opposite qualities. 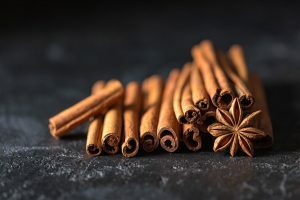 Cinnamon, an ayurvedic spice for fall. Abhyanga: traditional massage with traditional warm oil, soft and enveloping. Shirodhara: a stream of warm oil continuously flowing over the forehead to soothe the mind. Basti: cleans and nourishes the colon. 🍵 A small herbal tea idea: fennel seeds + hot water. 🍎 A little compote idea: apples, pear, cinnamon, ginger, cardamom. Check out the activities proposed by Chloé and Sarah.